Technical Analysis: What Is A Chart? Indicators represent a statistical approach to technical analysis as opposed to a subjective approach. By looking at money flow, trends, volatility, and momentum, they provide a secondary measure to actual price movements and help traders confirm the quality of chart patterns or form their own buy or sell signals. Leading Indicators. Leading indicators precede price movements and try to predict the future. These indicators are most helpful during periods of sideways or non-trending price movements since they can help identify breakouts or breakdowns. Lagging Indicators. Lagging indicators follow price movements and act as a confirmation tool. These indicators are most useful during trending periods where they can be used to confirm that a trend is still in placing or if it’s weakening. Oscillator. Oscillators are the most common type of technical indicator and are generally bound within a range. For example, an oscillator may have a low of 0 and a high of 100 where zero represents oversold conditions and 100 represents overbought conditions. Non-bounded. Non-bounded indicators are less common, but still help form buy and sell signals as well as show strength or weakness in trends. However, they accomplish this in many ways without the use of a set range. Indicators generate buy and sell signals through crossovers or divergence. Crossovers are the most popular technique whereby the price moves through a moving average or when two moving averages crossover. Divergence occurs when the direction of a price trend and the direction of an indicator are moving in opposite directions, which tends to suggest that the direction of the price trend is weakening. Indicators can be extremely helpful in identifying momentum, trends, volatility, and other aspects of a security. But, it’s important to note that indicators work best when combined with other forms of technical analysis to maximize the odds of success. The accumulation/distribution line is one of the most popular volume indicators that measures money flow in a security. The indicator attempts to measure the ratio of buying and selling by comparing the price movement of a period to the volume for that period. Traders use the indicator to gain insight into the amount of buying compared to selling in a given security. 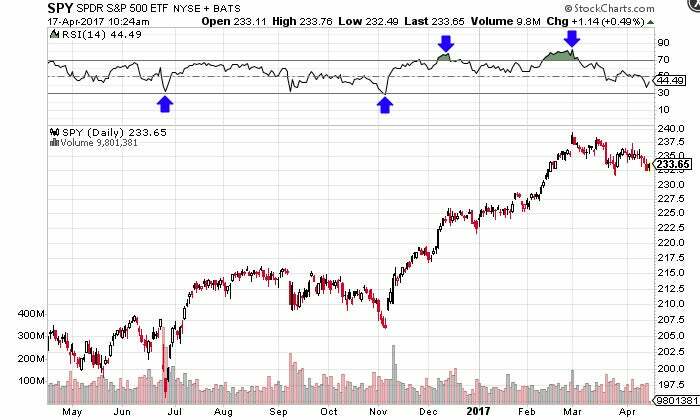 If the accumulation/distribution line is trending upward, it’s a sign that there is more buying than selling and vice versa. The average directional index (ADX) is a trend indicator that’s used to measure the strength of the current trend – although it has limited use identifying the direction of the current trend. The ADX is comprised of the positive directional indicator (+DI) and the negative directional indicator (-DI). The +DI measures the strength of the uptrend while the –DI measures the strength of the downtrend. These two measures are also plotted along with the ADX line that measures on a scale between zero and 100. Traders generally look for readings below 20 that signal a weak trend or readings above 40 that signal a strong trend. The Aroon indicator measures whether a security is trending higher or lower as well as the magnitude of that trend. In addition, the indicator can be used to predict when a trend is just beginning to help traders capitalize on the movement. The indicator is comprised of the ‘Aroon Up’ blue line and the ‘Aroon Down’ red line. The Aroon Up line measures the amount of time that has passed since the highest price during the time period. The Aroon Down line, on the other hand, measures the time that has passed since the lowest price during the time period. The number of periods used in the calculation depends on the timeframe that the trader wants to analyze. The Aroon oscillator expands upon the Aroon indicator by plotting the difference between the up and down lines by subtracting them. This new line is then plotted between the range of -100 and 100 with the centerline being the major signal line that determines the trend. The distance from the centerline is used to determine the strength of the trend higher or lower. A trend reversal occurs when the oscillator crosses above or below the centerline, while divergence between the price and oscillator can be used to foreshadow a reversal. The Aroon lines and oscillator are simple concepts to understand, but they yield powerful information about trends that can be invaluable in a traders’ arsenal. 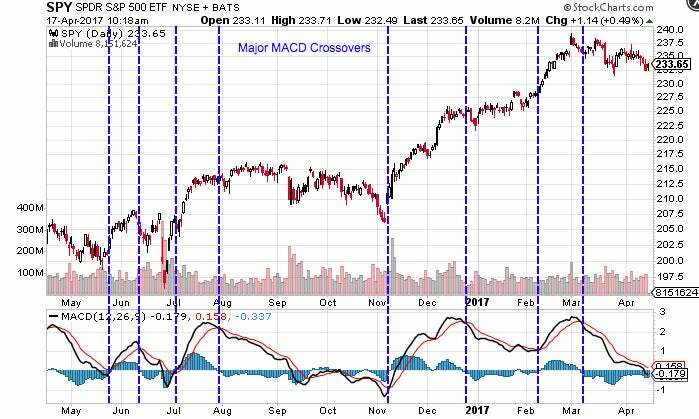 The moving average convergence-divergence (MACD) is one of the most powerful and well-known indicators in technical analysis. The indicator is comprised of two exponential moving averages that help measure momentum in a security. The MACD is simply the difference between these two moving averages plotted against a centerline, where the centerline is the point at which the two moving averages are equal. The exponential moving average of the MACD line itself is also plotted on the chart. 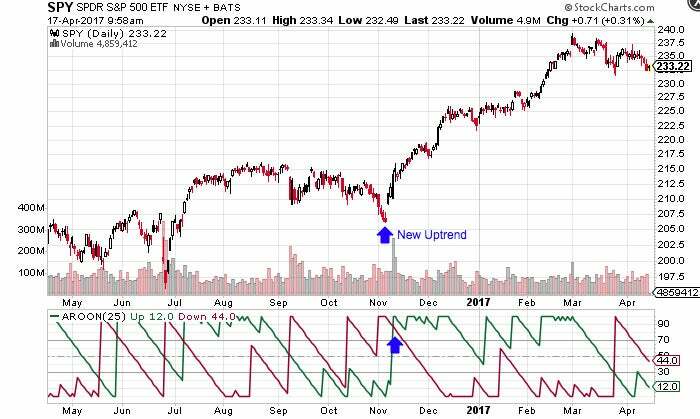 The MACD compares short-term momentum and long-term momentum to signal the current direction of momentum rather than the direction of price. Traders can think of it as the ‘derivative’ of price-based moving averages. When the MACD is positive, it signals that the short-term moving average is above the long-term moving average and the security’s momentum is upward. The opposite is true when the MACD is negative, which signals that the short-term moving average is below the longter term average and suggests downward momentum. The most common EMAs used in the calculation are the 26-day and 12-day averages, while the signal line is often created using a 9-day MEA of the average of the MACD values. These values can be adjusted by traders, but it’s worth noting that these values are the most widely followed. The MACD histogram is also plotted along the centerline using bars. Each bar represents the difference between the MACD and signal line, or in most cases, the 9-day exponential moving average. Higher bars in either direction represent greater momentum behind the price movement. (For more information, see Moving Average Convergence Divergence Part 1 and Part 2, and Trading the MACD Divergence). Figure 19 shows some of the major MACD crossovers that suggest a change in price momentum over time. The relative strength index (RSI) is another well known momentum indicators that’s widely used in technical analysis. 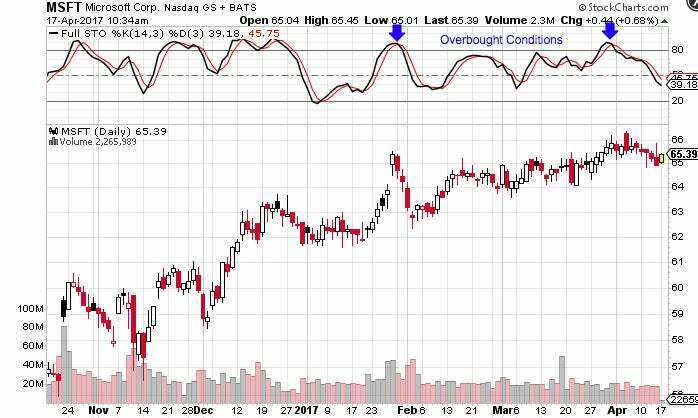 The indicator is commonly used to identify overbought and oversold conditions in a security with a range between 0 (oversold) and 100 (overbought). A reading above 70 suggests that a security is overbought, while a reading below 30 suggests that a security is oversold. Often times, the indicator is used by traders to determine if the price has been pushed to unreasonably higher or low levels after a snap reaction to news. The standard RSI calculation uses 14 trading days as a basis, although this figure can be adjusted based on a trader’s individual needs. (To read more, see Momentum and the Relative Strength Index, Relative Strength Index and Its Failure-Swing Points and Getting to Know Oscillators – Part 1 and Part 2). The On-Balance Volume (OBV) indicator is a simple volume-based indicator that’s used to understand changes in volume over time. The OBV indicator is calculated by taking the total volume for a trading period and assigning it a positive or negative value depending on whether the price increased or decreased over the period. When the price increased, the volume is assigned a positive value and a negative value is assigned when the price decreased. The positive or negative volume total for the period is then added up to a total that is accumulated from the start of the measure. Traders often look at the trend in OBV over time rather than the indicator’s specific value at any given point in time. (For more insight, see Introduction to On-Balance Volume). The stochastic oscillator is one of the most recognized momentum indicators in technical analysis. The indicator works on the premise that prices should be closing near the highs of a trading range during upswings and toward the lower end of a trading range during downswings. The stochastic oscillator is plotted within a range of zero and 100. Readings above 80 are considered overbought while readings below 20 are considered oversold. The oscillator has two lines, the %K and %D, where the former measures momentum and the latter measures the moving average of the former. The %D line is more important of the two indicators and tends to produce better trading signals. The stochastic oscillator generally uses the past 14 trading days in its calculations, but as with any indicator, can be adjusted by traders to meet their needs. (To read more, see Getting to Know Oscillators – Part 3). Don't be confused about whether a long-term trend will continue, stall or reverse. Find out how volume, the Aroon indicator and Fibonacci numbers can improve your profits. Learn about the top indicators and tools trend traders use to establish when trends exist and find entry and exit points. Learn how the stochastic oscillator indicator is sensitive to price, and discover technical indicators traders use to complement it such as the RSI and MACD. The stochastic oscillator and the moving average convergence divergence (MACD) are two indicators that work well together. Two indicators are usually better than one. Find out how pairing the stochastic and MACD can enhance your trading, and reveal entry points.